Chelsea and England midfielder Frank Lampard has won the Football Writers' Footballer of the Year award. The 26-year-old was the Blues' top scorer with 12 league goals as they won their first title since 1955. He was selected ahead of his Chelsea team-mate John Terry, who picked up the Professional Footballers' Association player of the year award last month. Together the Chelsea pair polled 90% of the votes, with Liverpool defender Jamie Carragher in third place. Lampard becomes the second Chelsea player to pick up the prestigious award, following Gianfranco Zola in 1997. He is also only the third Englishman to do so since Alan Shearer in 1994, with Teddy Sheringham the other in 2001. Lampard commented, "It means a massive amount to me really. I was quite confident my time would come and I would win these kind of awards - I'm delighted it's happened now. "It's a very prestigious award - I've looked down the history of players who have won it and I'm proud my name's alongside theirs. "I had a very good season last year but little things have improved this season and my confidence has improved." Lampard praised manager Jose Mourinho for bringing the best out of him - and also appreciated the efforts of previous Stamford Bridge boss Claudio Ranieri. The England midfielder continued "The manager came in and showed lots of confidence in me and I just worked very hard - and the goals have come thick and fast in the second stage of the season. "He's a players' manager and he respects you - he likes to have intelligent players who are able to take up different roles in the team. "I'm pleased I've had two managers over the last three or four seasons who feel I should be in the team week in week out." Lampard is also proud of the strides Chelsea have made this season. He continued: "I want to win trophies and individual honours so when I look back at the season I'm delighted. "We've won the Premiership comfortably and I'm proud to be part of a team that's made history - what the team has achieved this season is fantastic." Is Lampard a worthy winner? And Lampard believes the club will go from strength to strength next season, adding: "I think we will go onwards and upwards. We've got a lot of young, hungry players and a manager who has a winning mentality. "I'm more confident in myself, I have real belief in myself and I enjoy what I've done this season. I'll come back again hungrier to achieve even more next season." Gerry Cox, chairman of the Football Writers Association, said: "It was a close-run thing between the two Chelsea team-mates until a fortnight ago, but Frank Lampard ended up winning by a substantial margin. "John Terry has been a huge player for Chelsea in what has been a fantastic season for the Blues, but Lampard has clearly convinced our members that he is the best player in the country and right up there with the world's leading players. "His all-round game is superb, his fitness phenomenal and the fact that he has weighed in with 18 goals this season makes him something special for any team." 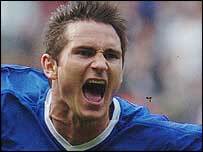 Former West Ham player Lampard has started every Premiership game for the Blues this season and got both goals as Chelsea made sure of the title with a 2-0 win over Bolton last weekend.